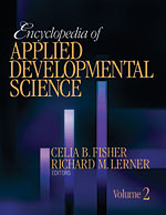 Editor/Author Fisher, Celia B. and Lerner, Richard M.
The Encyclopedia of Applied Developmental Science is an important and timely contribution to this burgeoning field. This is the authoritative source that encompasses the entire range of concepts and topics involved in the study of applied developmental science. Its contents and levels have broad appeal for those interested in how the application of knowledge about human development can be used to enhance the lives of individuals, families, and communities.